There is possibly no combination in the world more perfect than, outdoors, BBQ, sport and cold beer. It’s the perfect scenario to invite a few mates around and really enjoy yourself. Just the thought of it can get you inspired to get out the mower and get your yard ready for game day. This perfect set up can get crushed if the beer, BBQ and outdoors is on one side of the wall, and the TV, streaming the sport, is on the other, especially when you are the one stuck with the BBQ tongs turning steaks and snags. You can hear them all roaring at the screen, but your ‘friends’ have trouble remembering to keep you in the loop on the score! We have a way of keeping all the good stuff on the same side. No crossing over the threshold here. The answer is OUTDOOR TV. And when I say that, I don’t mean move your indoor TV to the patio table, that’s a disaster waiting to happen. First, you have the plug, which is going to be tripped over whenever there is a bathroom break. Also, TVs are heavy and thanks to flat screen technology, liable to topple over when the table is knocked (which is every scoring opportunity and every beer recharge). That outdoor setting is just not as sturdy as a wall mount or indoor entertainment unit. Nothing will ruin your entertainment faster than the TV smoking on the ground with sparks zapping out of it. 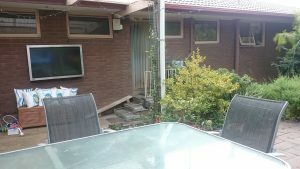 Our recommendation is to get an outdoor TV securely installed, and not one of those custom TVs that cost a fortune and aren’t as good as a regular TV. I mean encasing a TV you really like in a weatherproof case so you can put it outside ready for action. It’s easier, simpler and cheaper than you think and takes your backyard experience to a whole new level. Here are five things to consider before introducing an outdoor TV to your backyard. This is the fun part. Planning where to set up your outdoor TV. Because this is a semi-permanent fixture, you need to take a few things into consideration before you go ahead. Firstly is light. While the Seal TV enclosure does cut down glare and will protect your TV from heat and sun, it is best to avoid having direct sunlight streaming onto the TV screen around your usual watching times. Colours, contrast and clarity will improve when the screen is not in direct sunlight. At the same time, you probably need to be careful about the direction. If you mount the TV on an Eastern facing building or wall, be careful that you are not exposing the people watching to a face-full of setting sun. Heat is also something you need to keep in mind if you want to mount your TV close to the BBQ or a fireplace. The Seal TV enclosure for your TV is fireproof, however you might want to think about elevating your TV a little more if heat is going to be an ongoing factor. 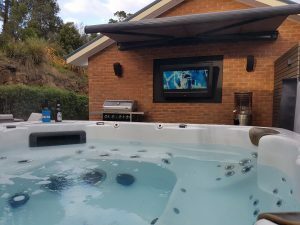 With SealTV’s waterproof enclosures you don’t have to worry too much about splash problems from pools and pop-up sprinkler systems, however, you will need to make sure your TV isn’t going to get submerged or flooded. The final thing you need to keep in mind is height. Ideally you want the place the TV high enough to be seen from different areas of the yard and from different angles. Maybe beanbags, chairs and standing as well as from the BBQ, the lawn and the patio. Experiment with placement, especially height using a template to see if you can minimise blind spots and utilize as much of your yard as possible. This is good for when you have larger gatherings or when you are doing work around the garden. While your TV will be completely sealed and protected from the outdoors, you might want to consider the added protection of installing the TV in an enclosed area like a gazebo or pergola to give your TV a long and happy life. Saying that though, your Seal TV enclosure can be reused if you want to update or upgrade your TV over time. Now that you know where you want to install your TV and at what height, it’s time to decide how to mount it. The SealTV enclosures are theft proof as they are designed to fasten securely to a wall or corner with brackets. Ideally your chosen location already has an existing wall, fence or secure place to hold a TV. If you don’t have anything suitable already set up you can choose to install a pole or post. This is an easy and flexible option if you don’t want to go to the trouble of building a gazebo for your TV. You might want to consider a ceiling mount if you don’t have a lot of space but would like to entertain a large group of people. You will need to go with a ceiling pole bracket for this one. 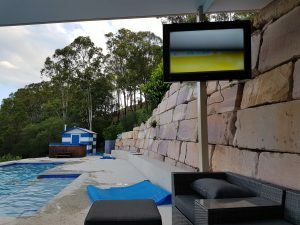 A TV designed for outdoors is practical but expensive. Also the range is limited, as is the brand. A SealTV enclosure is a versatile, flexible and budget-friendly option. Using a SealTV enclosure you can choose any kind of flat screen TV in a range of sizes. You can choose to leave some room as well and get a bigger casing for some upgrade space later on. You also might like to have speakers installed in the case as well, so have a chat to our team or see the size guide on BLOG for more ideas. The best news is, if you already have a spare TV laying around or you are thinking about upgrading your lounge room TV, you can usually find a case to fit your existing box and move it outside knowing it’s safe and protected from the elements. Choose the brand you love, the screen size you want and get a SealTV enclosure to match. This is one of those where it comes to personal taste. What is most important to you when it comes to your outdoor TV? If it’s quality images and reliable connection you are best to go with an outdoor cable set up. If your Seal TV case is large enough you can also use it house any boxes or cables you might need. Also look at protecting any wires or connections with outdoor quality conduct or pipe. Cable casing isn’t great outdoors, it can crack and become brittle when exposed to sunlight and wet conditions (keeping in mind dew will sit heavily over any exposed cables). Consider piping or UV light protected cables. Also consider using a safe outlet, a Ground Fault Current Interrupting (GFCI) outlet is recommended. If you want hassle-free installation and a clean look for your unit go for wireless if this is something your service provider had available, You can also look at installing apps that turn your phone into a remote control. The wireless option may require some extra patience from time to time when connections aren’t great. 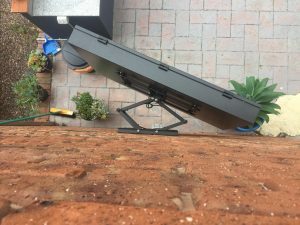 Depending on your TV sound quality, the distance between the TV and the BBQ, the size and space of your entertainment you might like to invest in some additional sound. While your TV might sound great inside, remember there is a lot more space for the sound to travel in the open, as well as more competing noise, like people in the pool, chatter and cheering. SealTV can supply powerful mini speakers that sit securely inside your TV weatherproof enclosure. So get that mower out, tidy up the yard and message your mates. The game is on. This entry was posted	on Sunday, February 4th, 2018 at 3:01 pm	and is filed under Blog. You can follow any responses to this entry through the RSS 2.0 feed. Both comments and pings are currently closed.